With the 2009-2010 domestic season finished most of the basketball news in May was about the player "merry-go-round". Only three clubs officially completed their transfers before this article was written: Aix-en-Provence, Bourges Basket and Lattes Montpellier. Tarbes Elite, the professional side of the basketball club have not completed their roster for next season but have announced the signing of three players: Ana Cata-Chitiga (pictured), Darline NSoki and Jelena Dubljevic. The club had announced earlier in the season that Alain Jardel would become head coach for the new season. At the moment only four players from the championship side are confirmed as returning next season: Isis Arrondo, Florence Lepron, Pauline Jannault, and Naura El Gargati. Arras have only officially confirmed the arrival of Laury Aulnette from Bourges Basket Espoir and the departure of Hanna Bouldwin-Biernacka and N'Deye N'Diaye. USO Mondeville have confirmed the signing of K. B. Sharp and Anne-Sophie Pagnier. In the meantime Mondeville's favourite Caroline Aubert (right) was not offered a new contract and has since signed with Laurent Buffard at Nantes-Rezé. Nantes-Rezé have been very active in the recruiting market. With the news that Kathleen MacLeod wanted to return to Australia at the end of the season, Nantes did not waste much time in contacting Aubert. They have also signed one of the revelations of the season Joyce Cousseins-Smith from COB Calais. Latvian International Sabine Niedola (left) decided not to follow the NCAA route and will start her professional career with Nantes under Buffard. Villeneuve d'Ascq brings back to France Olayinka Sanni and Carla Thomas which means that Jolene Anderson and Lady Comfort will not be returning next season. At the time of writing this report Challes-les-Eaux officially closed their recruiting for next season with the signing of German international Romy Bär and former CFBB player Manon Morel. 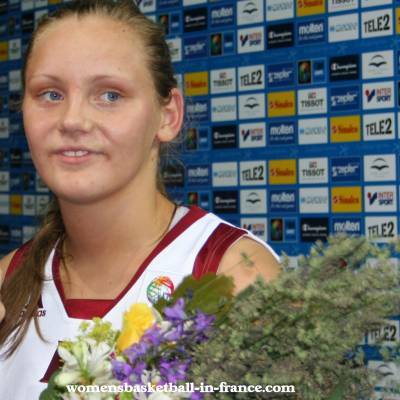 Jennifer Humphrey will be returning to Basket Landes after a season in Calais. COB Calais will have a new team next season with just Aurélie Cibert returning. The newcomers include: Sylvie Gruszczynski, Manon Sinico, Mélanie Arnaud, Pauline Love, Pelaggia Papamichail and N'Deye N'Diaye who had played for Calais before. Just two seasons after making all the basketball news for acquiring the sporting rights of Lot-et-Garonne (Temple-sur-Lot) Toulouse Cheminots Marengo Sports has been withdrawn from the LFB. The club's participation in the top division has been refused by the French Basketball Federation after the club's finances were checked last month. The club has three weeks to appeal and provide evidence that they can meet the financial requirement of the LFB.